You would be hard-pressed to find a gamer who has not at least heard of Super Mario. Mario first graced the video game scene in 1985 and has since evolved into a massive Nintendo franchise. Often joined by his brother, Luigi, Mario adventures throughout the Mushroom Kingdom, home to colorful characters like Princess Peach, Toad, Yoshi, Bowser, and more. Super Mario is an unforgettable element of many childhoods, and here at Superheroes Direct we offer fans of this legendary game series a variety of collectibles and apparel featuring favorite characters like Mario, Luigi, Yoshi, Toad, Princess Peach, and Bowser. We also carry accessories, like jewelry and hats, featuring the iconic graphics, symbols, and logos of various Mario video games. 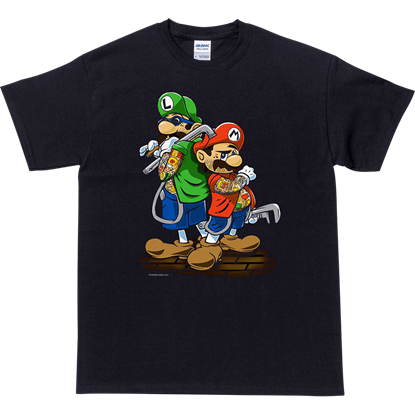 Humorously depicting the classic video game characters Mario and Luigi in a less chivalrous manner, the Super Barrio Brothers T-Shirt is a colorful shirt which is perfect for expressing your sense of humor and gaming interests.